BJ HK63 CNC eszterga - CNC gép, kábelvédő, fúrótömlő; Kutenich Kft. The lathe HK63 and its variant, the CJK6163 both feature a strong cast iron bed and quenched and burnished guideways. With FANUC 0i Mate, MITSUBISHI E60, SINUMERIK 802D, or DASENG CNC systems, these lathes are suitable for machining internal and external cylinders, cones, arc and curved surfaces, ends, and inch or metric threading as well. Featuring a 4-station turret and protection cover, CJK6163/HK63 CNC lathes are available for different needs. These machines are convenient to open and close, ensuring clean and safe production. The integrated control panel makes usage and programming very convenient for operators. These lathes are ideal for various types of middle and small batch production, and their excellent features make them suitable for complex and highly accurate machining tasks. 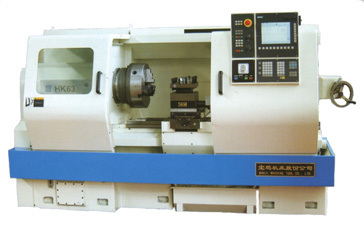 This lathe comes in two versions, the CJK6163 and the HK63. The CJK6163 has a spindle with 14 steps (18 to 1600 rpm). The HK63 is equipped with a 3-step gearless spindle. The machines can be ordered in a 1 000 mm, 1 500 mm or 2 000 mm size (ie. maximal work piece length). The lathes are available with mechanical timing or inverter timing.